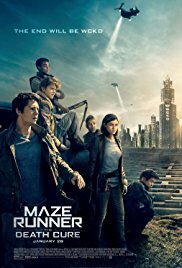 Having escaped a deadly maze designed to test and train the youth of the world, young Thomas (Dylan O’Brien) and crew are tasked with infiltrating the last known functioning city on the planet in order to rescue their friend Minho (Ki Hong Lee) and possibly put an end to the evil syndicate known as WCKD. But, once inside the city, new discoveries and revelations will lead to new questions about the true order of the world, might there still be hope for humanity and what will that mean for Ava Paige (Patricia Clarkson), the leader of WCKD? Directed by Wes Ball and based on the Young Adult novels of James Dashner, this conclusion to the series manages to shoehorn in an overabundance of plot points into the already lengthy two hour and twenty two minute screenplay, a move that ultimately creates unnecessary bloat and doesn’t necessarily make for a better film– just a longer one. And, while all parts of the production feel adequate and up to snuff the end result is still equally forgettable even despite a series of wildly drawn out action sequences, which in fairness are pretty impressive but get lost in the shuffling madness. Passable enough for a matinee for those glued to the series but really more of a rental, bring on the next Young Adult pulp, we could go for something fresh. Maze Runner: The Death Cure is rated PG-13. 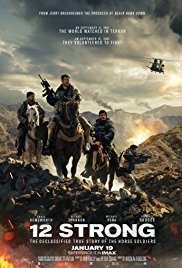 Based on actual events, 12 strong tells of the first Special Forces team deployed to Afghanistan after 9/11. Lead by Captain Mitch Nelson (Chris Hemsworth), this group of twelve would infiltrate the war torn country, win the support of Afghan warlord General Dostum (Navid Negahban), and cripple the Taliban with terrible losses in a matter of three weeks– an unprecedented and amazing feat that would impact each warrior for life. Recounting their battles and political jousting, this is their story. Directed by newcomer Nicolai Fuglsig and Cinematography by Rasmus Videbæk, this visual smorgasbord of military engagement doesn’t ask for tremendous emotional swings from the ensemble or the viewer, but does offer up a compelling narrative that pulls the viewer in to caring about the characters, even though the initial setup lacks creativity and originality. Not shying away from carnage and things that go boom, 12 Strong delivers concussive blow after blow to the viewer for just over two hours, this is after all a war movie, those with lighter stomachs might opt for lighter faire. Meanwhile, the ensemble thoroughly engages their killer eyes all the while bringing a bit of humanity to the insanity of the situation as a whole. Plunging a bit didactic in act three, the sentiments and terrors of war are not to be lost on the audience, perhaps there are more artistic ways to convey the message? Still, a strong contender for your matinee dollar this weekend. 12 Strong is rated R.
Former cop turned life insurance salesman, Michael MacCauley (Liam Neeson), is tasked into sleuthing out a fellow passenger on a commuter train by a mysterious woman (Vera Farmiga) with a sinister plan. But what are the driving forces behind this plan and just how far will all parties go to ensure their own success? Directed by Jaume Collet-Serra this ridiculous romp feels like the cross bred result of a film straight out of the Taken franchise and a flash back to 1994’s Speed, which is to say, it’s good to see Liam Neeson getting the opportunity to really stretch his abilities #sarcasticeyeroll. But, despite the lack of originality quotient running hot, the film still somehow manages to engage the audience in a moderately compelling manner just the same; then again, that could also be the inducing and effective musical score of Roque Baños, tough call. Perhaps best considered a Saturday matinee type film when it winds up on cable in the next few weeks, sometimes one just has to set their bar low in order to be pleasantly surprised. 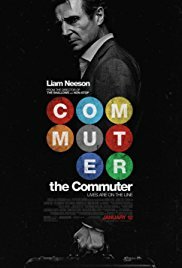 The Commuter is rated PG-13.